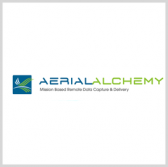 Aerial Alchemy is working with the Naval Surface Warfare Center’s Port Hueneme Division to study how to bolster the U.S. Navy‘s maintenance and fleet readiness through the use of unmanned aerial systems. NSWC said Thursday that UAS-gathered imagery of naval ships’ exterior surfaces may serve as basis to generate 3D models for identifying damage, rust and alignment concerns. The two parties have partnered to further look into this application under the Naval Innovative Science and Engineering research effort that aims to develop new in-service engineering technologies. “Our ability as in-service engineers to support the fleet currently requires extensive on-site personnel in order to identify configuration, damage, corrosion, and other mechanical issues,” said Alan Jaeger, manager at the NSWC PHD office of research and technology applications. “The concept of a ‘digital twin’ or as-built models of surface ships provides extensive opportunities to better serve the fleet,” he added.